It’s no secret that snacking on nuts has some significant health benefits. But did you know that apart from lowering your risk of heart disease, nuts can also help keep your weight in check? The snacks you choose can make a big difference in your weight over time. So, in order to stop the pounds from creeping on, say no to chips and pass the nuts, please. “All foods are not equal, and just eating in moderation is not enough,” suggests Dariush Mozaffarian of the Harvard School of Public Health. Mozaffarian’s study titled “Changes in Diet and Lifestyle and Long-Term Weight Gain in Women and Men” published in the New England Journal of Medicine found that certain foods — including nuts — were associated with less weight gain even when participants consumed more. For this reason, Mozaffarian suggests that eating nuts and weight loss are linked to a reduced intake of other foods higher in calories. Foods like nuts have higher fiber content and are slower to digest, which makes you feel full longer. And that means eating less highly processed and fattening foods. Five large human epidemiological studies found that nut consumption is linked to a lower risk for heart disease: the Adventist Health study, the Iowa Women’s Health study, the Nurses’ Health study, the Physicians’ Health study and the CARE study. Almonds are high in monounsaturated fats, which are the same health-promoting fats found in olive oil and associated with reduced risk of heart disease. Most fats found in nuts are mono and polyunsaturated fats. These fats lower your low-density lipoprotein cholesterol level (the “bad” cholesterol that puts your heart at risk). According to data from the Nurses’ Health study, the fat from one ounce of nuts is associated with a 30 percent reduction in coronary heart disease risk. Researchers calculated an even greater risk reduction — 45 percent — when fat from nuts was substituted for the saturated fats found primarily in meat and dairy products. In addition to healthy fats, almonds are also a good source of vitamin E, magnesium and potassium. Magnesium is nature’s own calcium channel blocker, says WHFoods. If your body has enough magnesium then veins and arteries relax, which lessens resistance. It also improves blood flow, oxygen and nutrients throughout the body. Walnuts are another heart-healthy nut. They contain the amino acid l-arginine, which offers many vascular benefits for anyone suffering from heart disease, or anyone who has an increased risk for heart disease due to multiple cardiac risk factors. In addition, walnuts also contain alpha-linolenic acid (ALA), which is anti-inflammatory and may prevent the formation of blood clots. In fact, according to research by the University of Maryland Medical Center people who eat a diet high in ALA are less likely to have a fatal heart attack and a nearly 50 percent lower risk of sudden cardiac death. So, that’s a great reason to eat more nuts! 2. 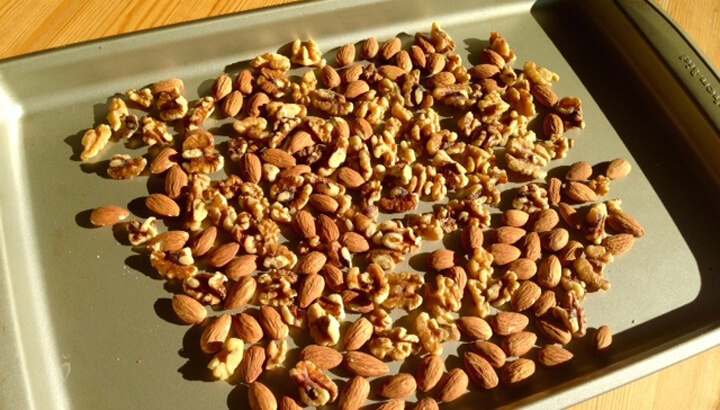 Spread almonds and walnuts on a baking sheet. 3. 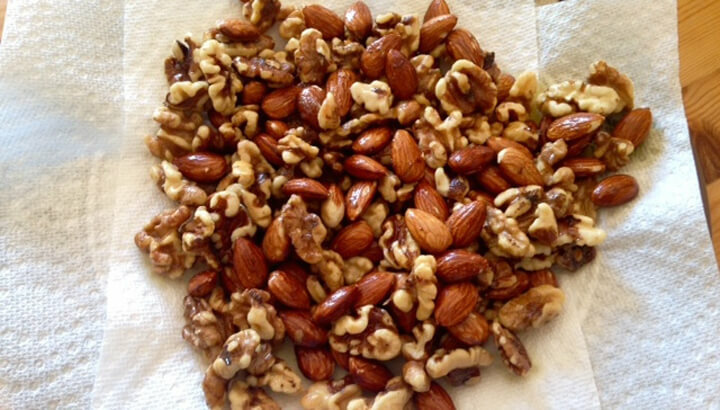 Now bake the nuts until they are golden brown and fragrant, about 10 to 15 minutes. 4. Next, transfer the hot nuts to a large glass or stainless steel bowl and set aside. 5. In a medium pan, add the olive oil, garlic, rosemary, red pepper flakes and sea salt and heat over medium-low heat, about 5 minutes. 6. 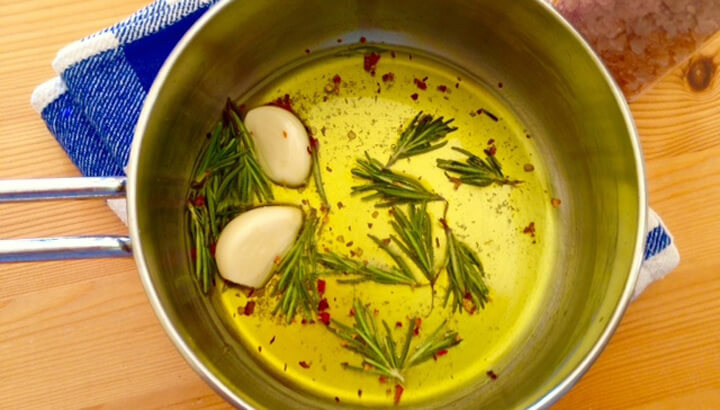 Mash the garlic and rosemary in the hot oil to release flavor. Then, heat for one more minute. 7. Pour the olive oil mixture over the nuts and stir until coated evenly. 8. Now transfer the nuts to a paper towel-lined plate. The nuts will still be shiny and slightly oily to the touch. Add additional sea salt to taste, if necessary. Enjoy! 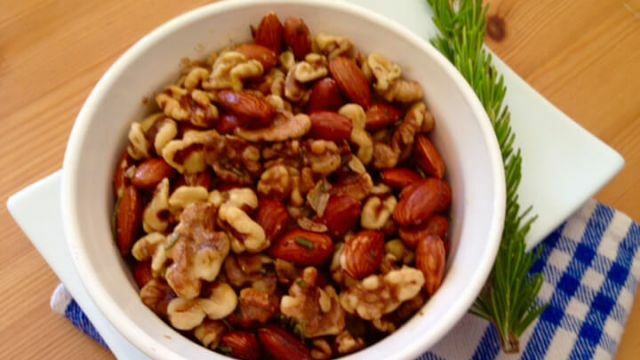 Hey Buddy!, I found this information for you: "Rosemary And Garlic-Infused Almonds And Walnuts". 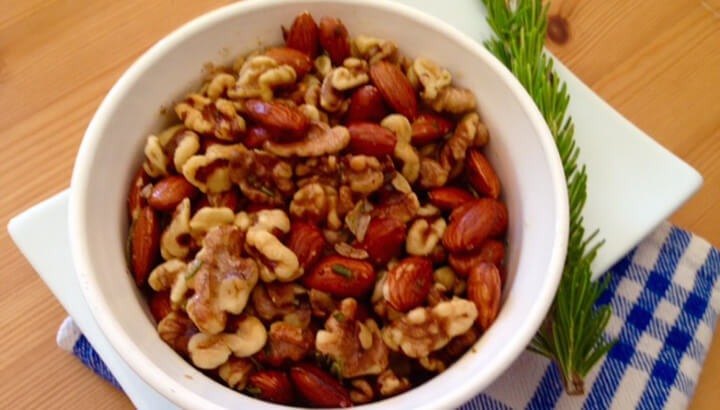 Here is the website link: https://www.thealternativedaily.com/rosemary-garlic-nut-recipe/. Thank you.